The HTC Desire or the iPhone 4: Which smartphone is better? Apple's fourth-generation iPhone, the iPhone 4, has finally hit Australia. Boasting a brighter screen, a faster processor and better battery life than its predecessors, the iPhone 4 is expected to maintain Apple's strong foothold in the smartphone market. Check out our original HTC Desire review. Check out our HTC Desire HD preview. If Apple's phone leaves you cold and you're looking for an alternative to the iPhone, then you're probably going to be eyeing off one of the latest Android smartphones. HTC's flagship Desire smartphone has been on the market for some months and is proving a popular choice thanks to a 3.7in AMOLED display, a 1GHz application processor, excellent build quality and a high level of user customisation through HTC's Sense user interface. With this in mind, how does the HTC Desire stack up against the Apple iPhone 4? Both smartphones stack up reasonably well, with each possessing its own strengths and weaknesses. The HTC Desire is equipped with HTC's Sense user interface and offers greater customisation options the iPhone — whether it's changing themes, backgrounds or the interface's entire look and feel, Google Android is definitely far more flexible and open than the iPhone platform. The iPhone 4's display uses IPS technology (also used by the iPad), and thanks to its 640x960 pixel resolution it has been described as a "retina" display, with the human eye unable to distinguish individual pixels on the screen. The HTC Desire boasts an impressive (and larger) AMOLED display, but the iPhone 4 is definitely a clear winner in this category. Its screen is particularly excellent at rendering text, making reading a highlight. The HTC Desire is larger than the iPhone 4, mainly due to the 3.7in display. Some may be irked by the Desire's plastic rear casing, but we think it looks good and doesn't detract from the overall build quality. The new iPhone's stainless steel band (which also doubles as the phone's antenna) is certainly intriguing, and, at just 9.3mm thick the iPhone 4 is one of the world's thinnest smartphones. Of course, it also suffers from widely reported reception issues when held in a certain way. The iPhone 4 holds a slight advantage when it comes to multimedia. Both smartphones feature similar cameras, but the iPhone 4 can record 720p HD video and its iPod integration is one of its outstanding features. However, there are a number of third-party media player applications designed for Google Android, and the flexibility of drag-and-drop file transfer is a real plus for the HTC Desire when compared to Apple's reliance on iTunes. The HTC Desire is available in Australia exclusively through Telstra. The iPhone 4 is available through all four Australian carriers — Telstra, Optus, VHA (Vodafone and 3) and Virgin Mobile. 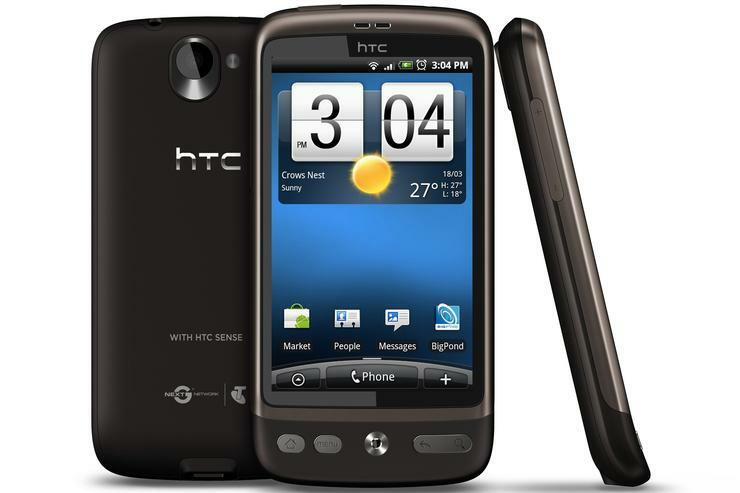 What do you think about the HTC Desire and the Apple iPhone 4? Tell us in the comments below! For full details on all the iPhone 4's new features, read our comprehensive iPhone 4 review. Are you buying an iPhone 4? What do you think of the Australian iPhone 4 plans? Let us know in the comments below!